Citroën and Rip Curl are pursuing their collaborative effort and unveiling the ultimate mobility object: the SpaceTourer Rip Curl Concept, an all-new interpretation of the SpaceTourer dedicated to outdoor pursuits. 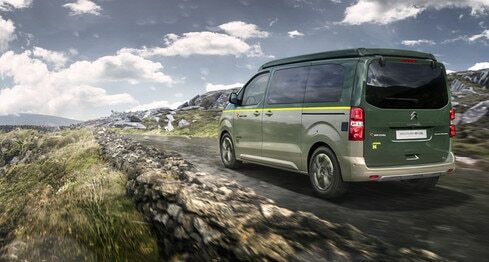 The off-road abilities of the modern van have been boosted through a 4WD conversion by Automobiles Dangel. 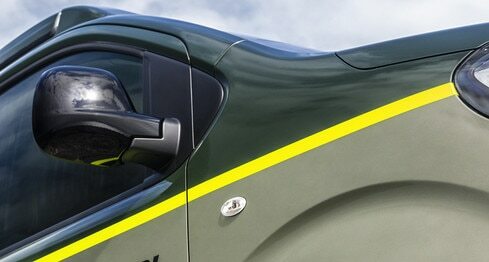 And for ultimate freedom, it has been kitted out as a compact camping car by Pössl. Watch a video on the SpaceTourer Rip Curl Concept. Driven by a shared affinity for creativity and innovation, the two brands are expressing their passion for adventure and the exploration of new territories, which Rip Curl refers to as “The Search”. 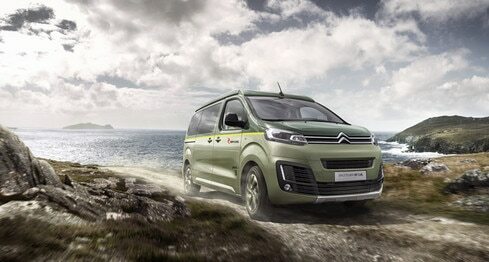 The partnership finds its fullest expression in this compact camping car concept that blends style and function. 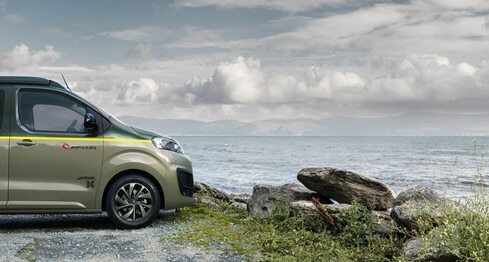 The SpaceTourer Rip Curl Concept is an invitation to hit the road on an unbounded adventure; perfect freedom, care-free. EUROPEAN TOUR: RIP CURL TOUR BY CITROËN! From October 2017 to January 2018, the SpaceTourer Rip Curl Concept will be touring Europe with the Rip Curl team aboard. The tour features 22 stop-offs at Europe's top surfing and skiing spots in Austria, France, Germany, Italy, Portugal, Spain, Switzerland and the UK. At each destination, visitors will be able to try out the latest innovations from the essential ski brand for free in the company of Professional Team surfers. right down to the two-tone exterior paint job. The chosen colours evoke a hard-wearing object in harmony with nature: a dark khaki for the upper section and a bright beige below. and adds a fresh flash of colour between the two shades. passenger car and leisure vehicle. The camping car version of the SpaceTourer was designed to be a “Swiss army knife”, an “all-in-one” vehicle that is a pleasant place to be and recharge your batteries after a day in the great outdoors. practical and optimise the available space. Equipped with two electric hands-free sliding side doors, the Campster can transport seven people in consummate comfort in “daytime” configuration. In “nighttime” configuration, the Campster can sleep 4 people on two double bunks. To make living inside the Campster more comfortable, the rising roof provides good ceiling height so you can stand up without hunching. The harmonious interior is coordinated with the external colour scheme. The seats play up the versatility to the full, with a two-tone horizontal line echoing the exterior theme and creating a greater sensation of space inside. The main part of the seats is upholstered in elegant khaki leather with horizontal embroidery for a ribbed effect. A fitted kitchenette with gas stove, sink, and storage so that meals can be prepared just as easily as at home. Passengers can enjoy their meals comfortably seated thanks to a large fold-away and sliding table joined to the kitchenette and facing the rear bench. In addition to the boot, which can be used to safely store larger luggage items, a number of locked storage compartments are located around the seats, beds and boot for storing everyday objects away from prying eyes. In an impressive feat, the SpaceTourer Rip Curl Concept contains two sleeping areas for four people. The back seat folds out to create a flat sleeping space free from any lumps thanks to a mattress topper, providing a comfortable double bed with its own privacy within the van. A second double bed is concealed in the rising roof. Indeed, opening the roof provides access to a mattress in the roof space, for an extremely comfortable bed above the cabin. The driving station in the SpaceTourer Rip Curl is an exact replica of the SpaceTourer’s consumer model, with all of the advantages that this affords. Equipped with the latest driver assistance and connectivity technologies, it offers cutting edge safety and ease of use, whether driving or manoeuvring. The SpaceTourer Rip Curl Concept is a strong all-terrain performer and offers the very best driving comfort in any environment. To meet the demands of intensive use, it comes with a fully declutchable transmission and higher ground clearance than the regular production version. The Turners are a singular British family composed of 48-year-old Lewis and Ellie, his 15-year-old daughter. Ellie showed exceptional surfing skills from a very young age. She formed a natural team with her father, who later became her coach, and her brother as they travelled to the world's greatest surfing spots. She is currently the UK surf champion and ranks second in the European professional junior category. Ellie and Lewis enjoyed an unforgettable experience on board the SpaceTourer Rip Curl Concept.